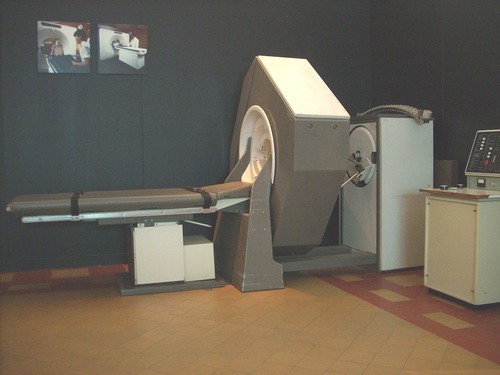 Devised in 1972 by Godfrey Hounsfield, the first EMI CT-Scanner "in Belgium (the sixth in the world) was installed in July 1974 in Michel Collard's radiological department in Montigny-le-Tilleul"1. This is the exemplar displayed in the Belgian Museum of Radiology's neuroradiology section, in the Museum Dr. Guislain, Ghent. Photo by Luca Borghiti.supmacinu|ihgrob.l# | (August 2009), courtesy of Museum Dr. Guislain. 1. R.Van Tiggelen, A Transparent Skull. An Illustrated History of Neuroradiology, Memogrames, Bruxelles 2007, p. 150.